User Tracker Count: 219 times. Very unique coaster, but I came off with a sour taste in my mouth. The racing aspect was cool and that was my main enjoyment in this ride because the hills were small and very tame. There was also only a little air to be found. Im glad this classic is still around, but I was hugely disappointed by it. 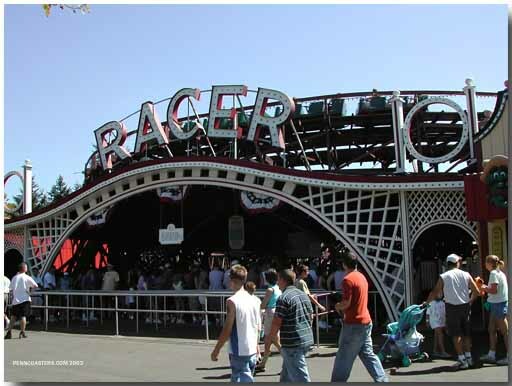 The entrance and giant sign looked great and I loved the racing element, but the ride itself was very dull. The hills were very small and the ride was slow throughout and therefore only two hills gave air time, and that was in the front. As told by Woody Allen in "Annie Hall", theres an old joke: 2 women are in a cafeteria, and one says "This food is terrible!" and the other says "Yeah, I know! And in such small portions, too!" You may or may not feel the same way about The Racer. Just about all of the hills seem about the same (though they obviously are not), which all are a bit bigger than the "bunny-hop" section of the log jammer. 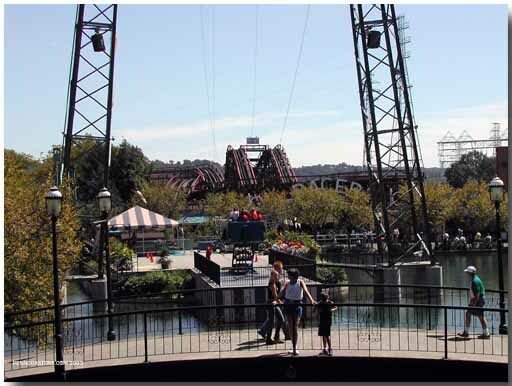 On top of that, once you get up the lift hill, the ride seems to last less than a minute. However, it is still boasts wondeful layout, rivaling Grand National (which is, unfortunately, superior) in being a morbeous racing coaster. The racing, which once seemed predictible, has unexpected outcomes on occasion, making it a great way to bring out some competition for all ages. In addition, the paint job and retro-station are quite charming. Though it is by far the least intense of all coasters in Kennywood (other than kiddie phantom), it is still a great starter for kids and a nice way to wind down after something crazy like Phantom or some wacky thrill ride. If you go to Kennywood, THEN YOU MUST RIDE THIS! Awesome classic dueling coaster. This is a must do. This ride is full of history and thrills. Great for anyone of all ages. This ride is decent. Not to thrilling but its ancient and its the only moebius coaster in the united states. Umm just do you all know I doubt you could go back to 1927 and build a racing coaster that is advanced as the Gemini or Lighting Racer. Anyway Its a great a little coster with little spots of air time. Plus because there is always two trains running the line moves fast. I think the face that it is a Mobeus coaster adds a lot to the ride, and why it is one of my favorites. My first moebius, and one of only 3 operating meobius in the world, this was the smoothest wooden coaster at Kennywood in my experience. Unfortunately, I was on the wrong side of the train for much hand-slapping to take place, and no one on the other train seemed to be attempting to hand-slap anyway (as opposed to Gemini at CP, where I narrowly missed hand-slapping opportunity with a fellow rider on the other side). There arent any great big drops, but consistent with a good, fun racer, the layout is solid, zippy enough, and fun, without beating you up. This is a great first woodie or larger coaster for younger riders, as I have rarely been on a "large" coaster that was so gentle. A few more forces might have been good, but I enjoyed the break from all the intensity the other coasters in the park provide. I would take the Thunderbolt or Jack Rabbit over it, but there arent that many coasters in the park, so one shouldnt have trouble getting at least one circuit on this one along with the others. On the ride I took, the racing element didnt work very well. The other train was half a length ahead of us up the lift hill, so it was obvious that we had no chance of winning the race at the beginning of the ride. The station is nice and has a classic feel to it. The ride itself is decent but nothing spectacular.